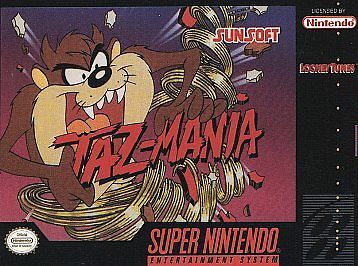 Taz-Mania for Super Nintendo has you beat the clock and collect his allotted number of kiwi birds at the risk of losing a life. Hordes of enemies will do their best to stop Taz as he runs, jumps, and spins his way through the game. Bull Gator and Axl, in particular, are hunters after Taz's rare hide. Being the bad guys they are, these two will place glue traps, bear traps, black holes, and oil slicks throughout the levels to catch Taz and sell him to the zoo.